Leukomed Control is a sterile, bacteria, virus and waterproof, transparent film dressing for the treatment of surgical and other acute wounds. It consists of a semi-permeable polyurethane film with a skin-friendly adhesive border and an absorbent hydropolymer wound pad. The transparent dressing enables visual wound inspection without removing the dressing and thus promotes undisturbed wound healing. As the hydropolymer wound pad absorbs exudate and supports optimal wound healing through partial hydration, Leukomed Control is suitable for dry and low exuding wounds. The skin-friendly, shower proof adhesive border ensures secure fixation. The high permeability of the film dressing to water vapour and oxygen helps to prevent build-up of fluid and maceration. Leukomed Control protects the wound from friction and shear and provides a barrier to bacteria, virus and external contaminants. 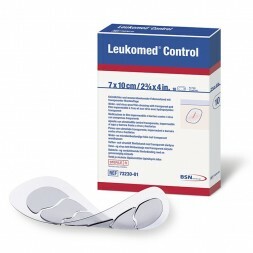 Leukomed Control is indicated for dry and low exuding acute wounds such as surgical wounds, superficial partial-thickness burns, skin donor sites, lacerations and abrasions.